Zoe is in Exmoor on a 3.5 day hike with her friends for the Duke of Edinburgh expedition. Serendipitiously, she is v. fond of all the three other girls with her, so they should have a great time, even though the bonds of friendship will, no doubt, be tested to the uttermost. We and Irene had a great morning in the interesting Museum of the History of Oxford. There were artefacts from paleolithic and neolithic times and a good Roman collection. You know, I didn’t know the Romans were in Oxford. We enjoyed the kilns and pottery, with the potter’s signature. The Romans introduced a lot of herbs to English cooking–parsley, chervil, coriander, garlic, onions, sage, rosemary–which have continued to be used ever since. They introduced their two favourite foods–sauces and sausages, which likewise have lingered. Then came the Saxons. I didn’t realize before that the City of Oxford grew around Friedeswide’s Minster, the site on which Christ Church Cathedral now stands. 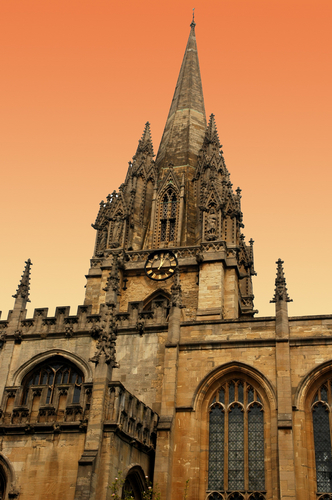 So Christianity has always been at the heart of the City of Oxford! I have lived in Oxford for 8.5 years, so you can imagine the pleasure with which I am taking my children to the Museum of the History of Oxford. This week, we looked at the Danish invaders to Oxford, who burnt down the wooden city. After that, Oxonians built in stone. The main thoroughfares (High street, Cornmarket, Queen’s street, St. Aldate’s) were around, and commercial centres in the 10th century. And so many names one still hears are from the Danish invaders. Medieval feasts were displays of wealth. They could take 6 months to prepare, and were eaten on pieces of bread as trenchers, with a knife, and one’s fingers!! Forks were not yet invented. I love Oxford. There is no place I would rather live! We watched a good 15 minutes film on the history of Oxford, then used the excuse that 11 year olds need to be fed regularly to take Irene to Nandos. Absolutely delicious grilled piri-piri chicken, which I have never had before. I would give a good deal for the recipe, and for Roy to learn to cook it.